Bilbao (Bilbo) amazes with its life, energy, its cultural development and at the same time with its peace and civility (in the proper sense of the word). It is the largest and most populous city in the Basque Country. Bilbao lies on the banks of Nervión River and is surrounded by green hills of Vizcaya province. Bilbao is a storehouse of modern architecture. In just two years there have been built: Norman Foster subway, an airport and a glass bridge over the river from Santiago Calatrava and the Guggenheim Museum, which is a masterpiece of Frank Gehry. In the late 20th century the city was a great industrial center. 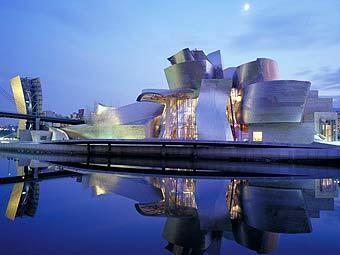 But in the 21st century after the Guggenheim Museum’s opening the city has gained an international cultural status. Bilbao car rental offers comfortable modern cars and pleasant prices. Hire car Bilbao and make your vacation bright and memorable. Explore the city with online car rent Bilbao! RentalCars24h.com offers you reliable car rental Bilbao services that will help you to feel free and independent when moving around the town. Providing best online prices for car hire Bilbao services, RentalCars24h.com allows you to save money each time when you rent a car in Bilbao.